Offering you a complete choice of products which include microprocessor disintegration test apparatus. 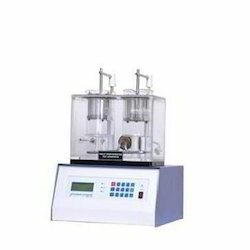 WE ARE MANUFACTURER OF Microprocessor Disintegration Test Apparatus. Baskets UP & DOWN MOVEMENT AS PER IP/USP Specification. 20×4 Line alphanumeric LCD display with backlit. LED's 4 LED's available for different status indications. 3 LED's for Test status like Run, Alarm, End and one LED for heater on/off status. Reaction Vessel - capacity 1000 ml - 2 Nos.